Explanation: Today is the first day of Autumn in the Northern Hemisphere of Planet Earth. The Autumnal Equinox occured yesterday at 7:56 pm EDT as the Sun crossed the celestial equator from North to South. Mars has seasons too and for the same reason that Earth does -- like Earth, Mars' axis of rotation is tilted with respect to the plane of its orbit around the sun. 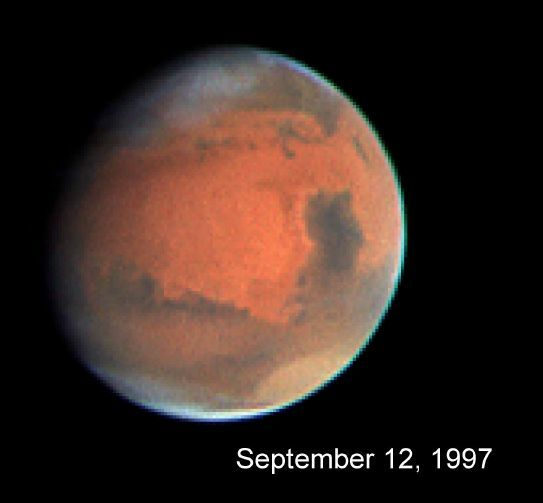 Eleven days ago Autumn also came to Mars' Northern Hemisphere and the Hubble Space Telescope recorded this image of the red planet to look for seasonal changes in the Martian weather. Clouds appear to cover the north polar regions while a dust storm rages in the south. The subject of weather on Mars is important to the just arrived Mars Global Surveyor spacecraft as it uses the innovative technique of aerobraking to establish a suitable mapping orbit around Mars.